In our summary of alternative distributions we said that we’re willing to trade some Synectar for other distros. There was no response for a while, but then we received a couple of messages from people that wanted to do this. They offered the old formula of Joylent (old = with oil) with different flavours and we offered Synectar. We made an agreement. One of these people was from our hometown, Bratislava (as we later found out, he lives really close to what we call “next door” to both of us) and the other from Brno, which is in the Czech Republic and not too far from Bratislava (1.5 hour by bus). We have a couple of friends in Brno too, so we thought about making a trip (no drugs involved) there. Then we received a message from a girl writing a dissertation on “politics of techno-food” which covers soylent-based foods and ideas as well. She studies in Singapore but comes from Prague, Czech Republic. She wanted to meet with us, ask us a couple of questions and discuss Soylent, soylent and the whole world around the future of nutrition. We still don’t feel like authorities in this matter but as we have some experience with DIY and know a little bit about the community we decided to go for it and meet with her. What do we have to lose anyway? Brno is on the half-way from Bratislava to Prague, so we decided that it would be ideal to meet right there. After some complications with dates and stuff, yes was “what she said”. We bought nice packages to put it into and also made some stickers to put on the packages. When we were “in the zone” we even made and “additional info” paper with instructions and nutritional facts! 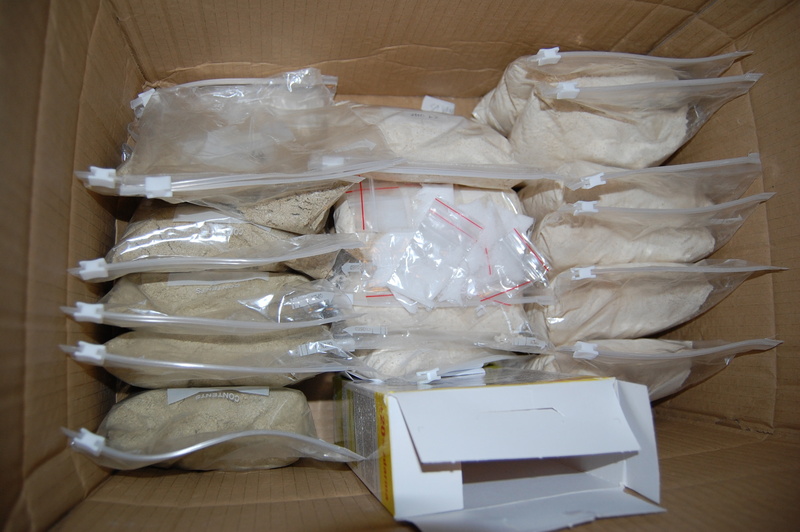 Who would guess what’s in that small legit-looking packs in the middle? We planned our trip to Brno on Monday’s morning and that meant that Sunday night is the best time to grab a beer with trader number one – Tomas (we might have been a little bit unforeseeingwrong about the time though). We met in a pub not too far from where we live, ordered beers, exchanged the packages and discussed all the things – food of the future, powdered food and as the night continued (and beer kept coming) also philosophy and many other more or less related things. Tomas brought two days of chocolate Joylent with small packages containing oil. We gave him Synectar for 2 days too and we added some samples to gave him the full Synectar experience. But then came that moment when we said “enough” and went home, to prepare the last things for Brno and to sleep for the trip. Monday morning was a little bit harder as we didn’t sleep too much, but we made it. We arrived in Brno, went for a burger (yes, we are allowed to eat non-liquid foods too), bought a sample of hemp protein for next batch and then went to a café. There we met with the Singapore/Prague girl – Marketa. She asked us a couple of questions (she even recorded our words to have a proof of our existence! ), we answered them and then asked her back a couple of our questions. And then we debated politics, food and activism. We gave her a samples of Synectar as well. As we later found out, she took it to Prague’s hackerspace BrmLab where it “competed” with Joylent. We are eager to hear (read) feedback :). 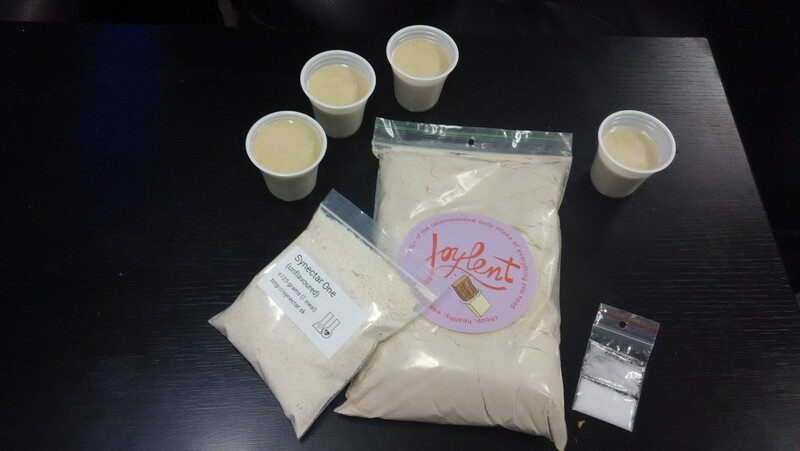 We had one more deal to finish – Joylent for Synectar, this time Banana and Vanilla. With our third new friend, Honza, we met in a Base48 – a hackerspace based near the center of Brno. We saw the surprise in his eyes when he realized at the door that there’s not only the two of us, but a couple of friends that joined along the way too. 6 people altogether. But he handled it like a boss – big thanks to him for hosting us in Base48, explaining 3D printers and for our discussion about soylent. We spent a good half an hour there. Happy that we made new “powdered friends”, that our trip was successful and we managed all we were up to we had a pleasant journey home and slept well. Thanks to all people (even those who aren’t mentioned by name) that we met during this trip, you too are the reason we enjoy doing this!